At the Grant County Chamber of Commerce (GCCC) Baquet held on Saturday, Feb. 18, Sheridan High School Special Education Teacher Linda Lewis (shown on left) was recognized as the Grant County Secondary Teacher of the Year. 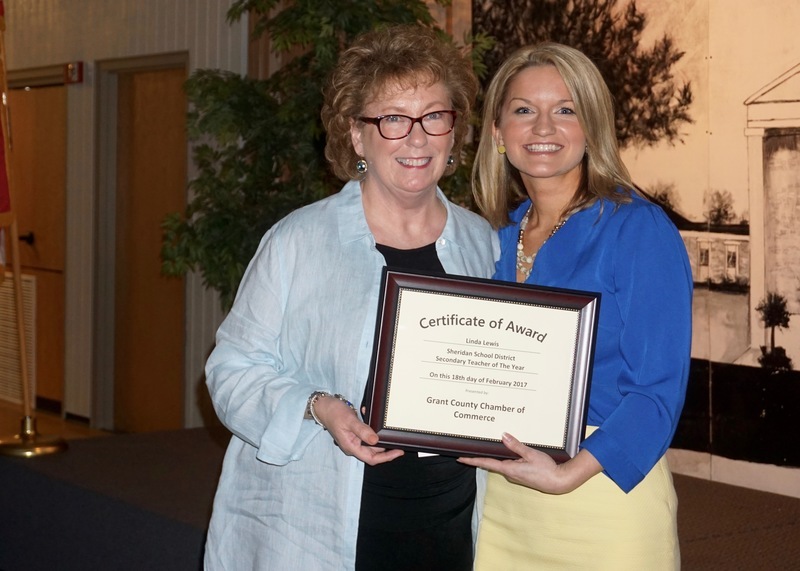 Lauren Goins (shown on right), SSD communications director and GCCC board member, presented the award. Lewis holds a Bachelor of Arts degree in Elementary Education from Hendrix College and a Masters of Science in Education for Special Education from the University of Central Arkansas. Always eager to learn and grow as an educator, Lewis completed additional coursework at the University of Arkansas for Medical Sciences and at the University of Arkansas at Little Rock. Lewis has 40 years of experience in education. Before teaching at the Sheridan School District, she served as a resource teacher for Conway Public Schools and taught emotionally disturbed students in the Little Rock Public Schools. For fifteen years, she served as Arkansas Department of Education Area Supervisor where she was instrumental in helping Arkansas schools develop Individualized Education Plans and modifications for students. Branching out of the high school arena, Lewis worked for five years at the University of Nebraska, teaching and supervising master’s candidates in Special Education.